2007 WIMBLEDON – Just a month ago in Paris, two dazzling brunettes, Rafael Nadal and Ana Ivanovic, stormed through their first six matches, with the Spaniard winning his third straight crown and the Serbian reaching her first Grand Slam final. But at the French Open, neither player had their back planted firmly against the wall as they did on Thursday at Wimbledon, when they shoulders were pinned so firmly against the hedge that they had green ivy marks on their shoulders. Both came through with incredibly impressive victories, with Ivanovic saving three match points and overcoming fellow teenager Nicole Vaidisova 4-6, 6-2, 7-5 to reach her first Wimbledon semifinal, and Nadal zoning to another planet in a 4-6, 3-6, 6-1, 6-2, 6-2 over Russian Mikhail Youzhny to reach the quarterfinals. This Wimbledon has been all about negotiating the soaking wet conditions and not dying from utter boredom while waiting for your name to called again in the locker room. It’s been very difficult for players to establish any particular rhythm, other than counting how long it takes to walk down two flights of stairs from the dining room, across the slick walkways, onto a misty court, and back again. Yes, and it a bit of cruel irony, his great rival, top seed Roger Federer, received a bit of the Spaniard’s bitter medicine, as for the first time in six days, the Swiss took the court and after playing 37 minutes against Juan Carlos Ferrero with the score tied at 5-5, the rain came and his match was eventually suspended. Federer had received a benefit of a walkover from the injured Tommy Haas in the fourth round, but now like Nadal, it looks like have to play every day to retain his crown. Nadal’s draw has been difficult, but not impossible and with each passing match, he’s showing himself to be a worthy challenger to Federer once again. He withstood a blood spat with Soderling, who mocked his on court habits at the beginning of their fifth set, and then an incredible barrage from Youzhny, who had upset him at last year’s US Open and taken him down two other times on hard courts. But the 21-year-old is resilient and is a great deal smarter than he was few years ago. He’s no longer stubborn and understands what he has to do when his typical style isn’t making a dent. Youzhny was all over him with flat, hard driving shots and Nadal wasn’t going to win the match retrieving. So the lefty began to go his groundstrokes and went for more with his serve and return. He became the bully and pushed the Russian flat on his back. Nadal is now two more steps from the final, but they are very long ones. He’ll play have to play another man who has given him fits in the past, tall Czech Tomas Berdych, whom he has never beaten off clay and suffered three sizeable losses to on hardcourts. Nadal knows that his fellow 21-year-old is going to bomb serves at him and try to keep the points as short as possible. No one defends as well as he does, but if the Spaniard doesn’t muscle up on enough balls, his hopes of reaching another final and stopping Federer’s run of four straight finals will go out the window. Ivanovic has a slightly bigger task than Nadal does as she’ll have to go up against the red hot, three-time Wimbledon champion Venus Williams, who took a quick victory over Svetlana Kuznetsova and is showing all of her championship form again. But that Ivanovic has even reached the semifinals shows how quickly she’s matured. She’s a grass court novice, but after her disappointing loss to Justine Henin in the Paris final, the 19-year-old was able to put that aside and apply her strengths to the green blades. She was extremely nervous contesting her first match on Centre Court, but began to trust her shots in the second set, pounding big returns, forehands and closing out at the net. She’s didn’t serve brilliantly, but well enough to keep her ambitious fellow teen from feasting on soft balls. The 18-year-old Vaidisova was in prime position to reach her third Grad Slam semifinal, but leading 5-3 in the last set, she couldn’t shut the battling Serb down. She had three match points, but Ivanovic ripped a forehand crosscourt winner, hit a huge serve and forehand down the line and then after Ivanovic finally served up a lollipop of a second serve, Vaidisova buried it into the net. The Czech then faded and a fist pumping Ivanovic roared, running off four games and winning the contest when Vaidisova double faulted. There is no way that Venus is going to allow the sixth seeded Ivanovic back into the match like Vaidisova did, so like Nadal said about his approach to playing Berdych, she’s going to throw big upper cuts at the American to have a chance. 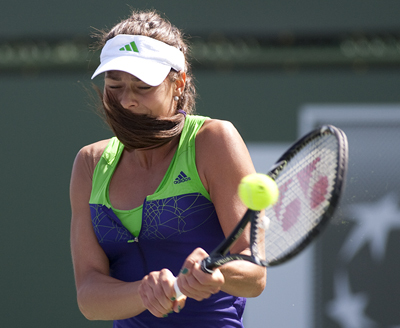 Ivanovic may have frozen up in the Paris final, but now believes in her big match capabilities.